The 5th day of our Amazon River Cruise with International Expeditions started off like every other day we’d been in Peru: With a morning expedition to see some incredible Amazon wildlife. 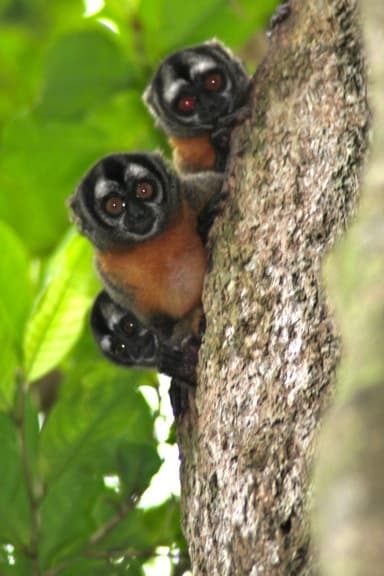 The most notable of our sightings was this trio of adorable owl monkeys, also known as night monkeys. As the latter name implies, this is one of the world’s only nocturnal primate species, with grey-necked owl monkeys found north of the Amazon and these red-necked varieties found primarily to the south. I’m guessing our early morning birdwatching excursion allowed us to catch these guys just as they were settling down to sleep. The day may have started out like every other, but it got better with each passing hour. 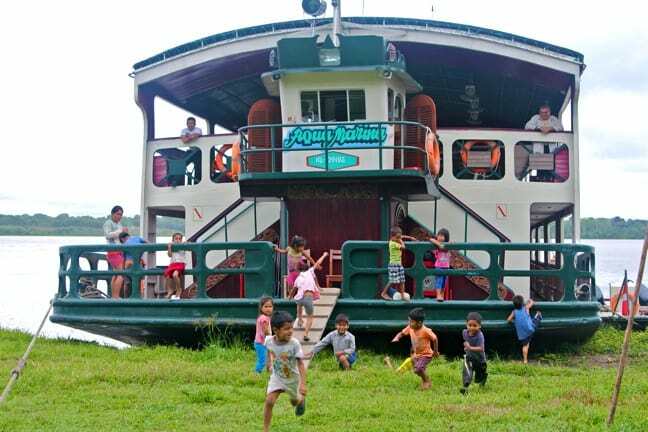 As we ate breakfast the Aquamarina made its way towards Nueva York, a typical Ribereños village situated right on the river. This was our first chance to explore an indigenous community and interact with locals, and it was easily one of our favorite experiences. International Expeditions works with several of these villages in the area, visiting a different one on each trip, helping to fund water treatment plants, donating school supplies, teaching the villagers about the importance of wildlife conservation and bringing in tourist dollars from the sale of handmade crafts. 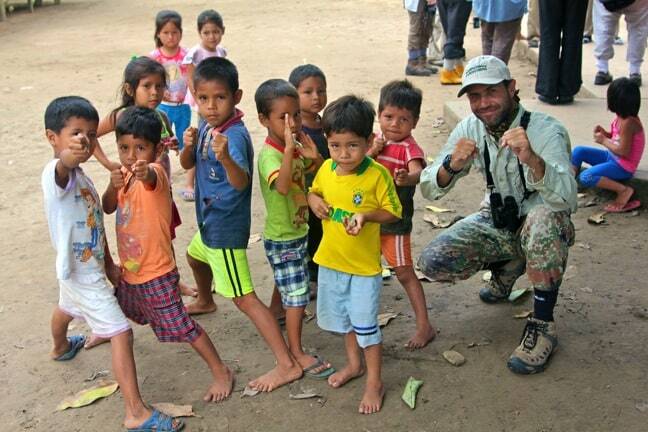 I simply cannot overstate how much fun we had playing with the Ribereños kids of Nueva York. Literally from the second the Aquamarina dropped our plank onto the shore, these little fireballs were using the ship as their very own jungle gym. The kid in the foreground of this picture and the boy in the green shirt and plaid shorts were especially endearing, jumping off the ship and rolling on the ground while giggling like fools. Their energy was infectious, and we found ourselves with a serious case of perma-grin watching their hammy shenanigans. As photographers, we often find ourselves more interested in the characters who lurk on the fringes much moreso than those who are constantly in our face, showing off in an effort to get our attention. While the kids were going crazy, we noticed this beautiful Ribereña with her baby and politely asked if she would mind us taking her photo. It was interesting because most of the villagers were very simply dressed without much in the way of accessories or other adornments, so this little beauty’s fancy pink flower definitely stood out. Still, those engaging Ribereños boys proved hard to resist. Wherever we went within the village, they would inevitably find us, strike some sort of ridiculous (but adorable) pose, patiently wait for us to take a picture, then urge us to show them the results. It seemed to result in a huge smile every time, so we indulged them time and time again. This pic is one of our favorites, as it shows our buddy (and excellent IE expedition leader) Renzo Zeppilli getting in on the act. 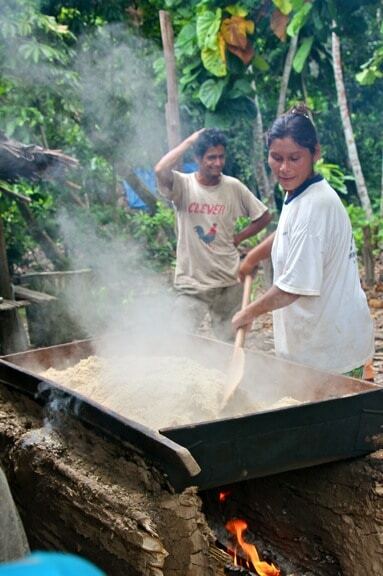 As we strolled through the village, we learned more about the typical Ribereños way of life. One of the first things we noticed was that the women seemed to do most of the work, while the men seemed to do a lot of standing around and watching. Here, a Ribereña roasts manioc (also known as yuca or cassava), a root vegetable that has been a staple of the Peruvian diet for thousands of years. Because it contains residual cyanide, manioc must be roasted over a fire for six hours, turning constantly to avoid burning. This lady looked delighted when I took over for a few minutes, smiling at a man doing what was clearly, to them, woman’s work. Eventually we were led inside the typical Ribereños home of the village leader (who they referred to as the Mayor). It was a simple but well-kept wooden home with a thatch roof, elevated on stilts in case the rising river waters came up over the bank. We learned that Nueva York was technically nueva Nueva York, as they’d been forced to relocate the entire village due to flooding. 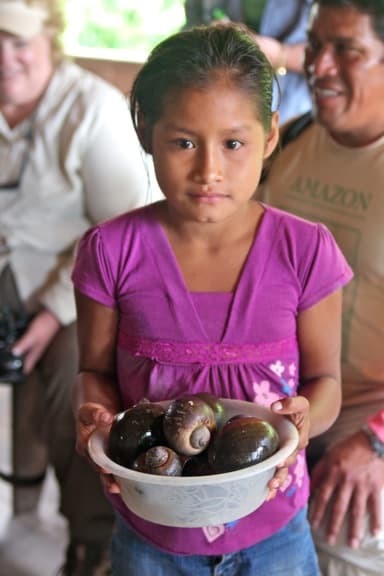 We also learned about how they lived, with two bedrooms for the parents and their 5 children, and what they ate, including fish and these apple snails held by their 8-year-old daughter Parquita. As we walked deeper into the village, we were struck by the sheer attractiveness of the Peruvian people. 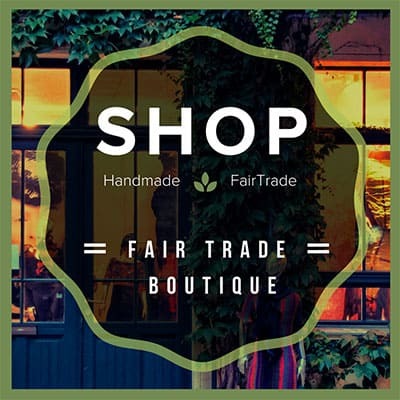 They wore no designer clothes, no makeup, and we only saw two people in Nueva York who wore jewelry, yet their faces were the epitome of natural beauty. We were also struck by how young some of the mothers were, including this teen nursing her baby. Here, it is not uncommon for women to give birth at 16, and to have up to a dozen kids over their lifetimes. Perhaps that explains why Ribereños women have much shorter life expectancies than men. Remember the movie There’s Something About Mary? 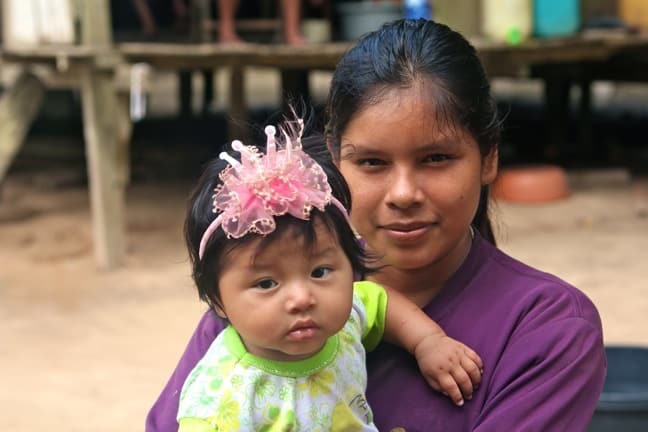 Well, it’s true: It seemed the further we went into the village, the bigger her adoring entourage seemed to get, with Parquita and older sister Lorita sticking to her side like glue. 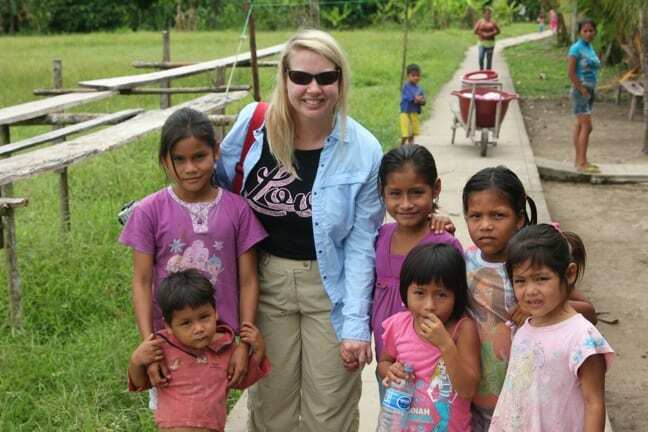 Maybe it’s the blonde hair, or that infectious smile… Also, note the sidewalk running the entire length of the village. According to our guides, sidewalk installation is the #1 request villages have for the Peruvian government, as it allows them to walk around at night and see any deadly pit vipers or fer de lances on the path. After an amazing cultural exchange experience at the village school in which the kids sang Peruvian songs for us and we performed a hilarious rendition of “The Hokey Pokey” for them. We sadly said goodbye and moved on to the next stage of our journey. 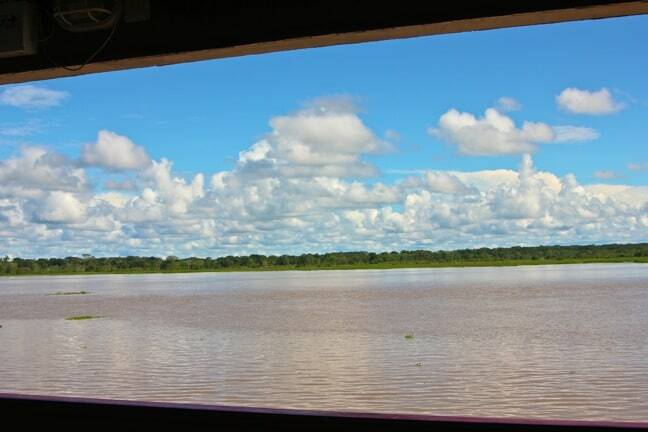 As we ate lunch before our afternoon siesta, I noticed what an exceptionally beautiful day it was, with brilliant blue skies and huge fluffy clouds providing a dynamic backdrop for the Amazonian landscape. I love the framing of the lines and colors in this shot. 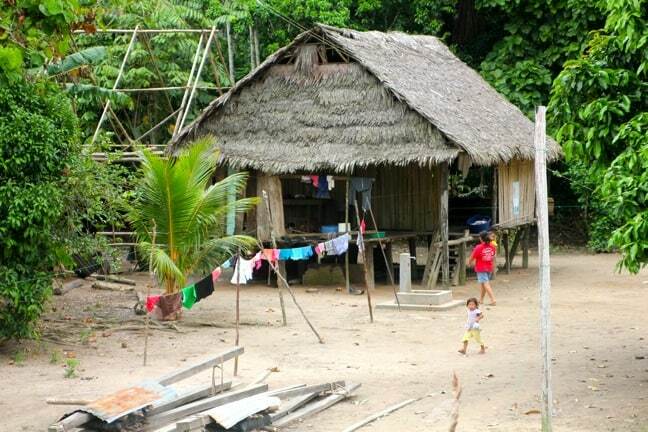 As we arrived in the village of San Jose, it was immediately obvious how deeply the Ribereños’ lives were intertwined with the mighty Amazon River. Not only did they get their food from it, bathe and wash their clothes in it; when it flooded, it came right to their doorsteps. 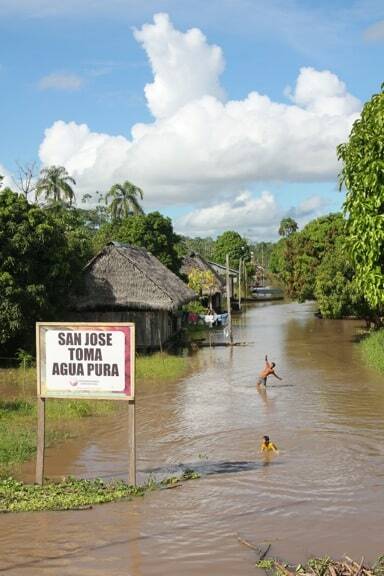 Here, their “main street” can be seen under several feet of water, with two boys happily splashing as they played a game of catch. The plan had been for us to walk around the village, but the flood meant we had to climb back into the skiffs to get to what proved to be one of the most memorable experiences of our lives. 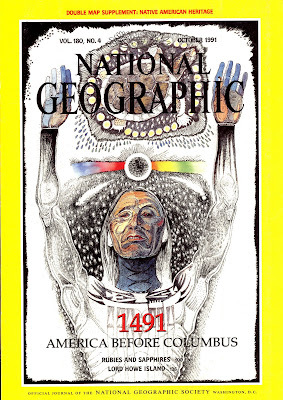 My biggest (and first) tattoo, taken from the cover an old issue of National Geographic I borrowed from my grandmother when I was 23, is an image of a shaman praying to his spirit animal. So when we found out our trip with IE would include a visit with a practicing shaman, I was ecstatic. 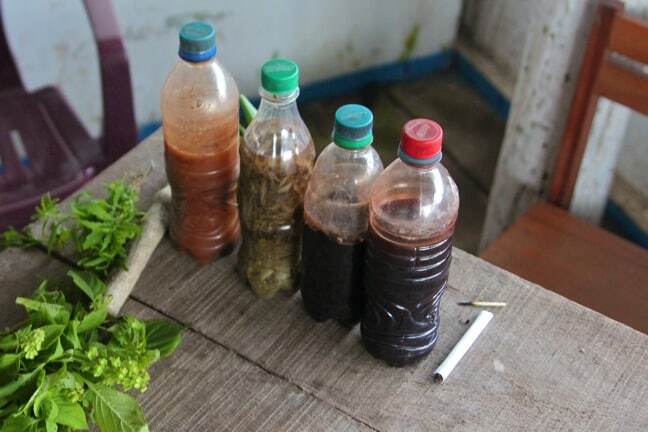 I’ve read several books about the subject, learning about the hallucinogenic properties of ayahuasca and the healing powers of various other medicinal plants found only on the Amazon. But to meet the Maestro (as our naturalist guide Johnny called 72-year-old Don Juan) and learn about his ancient craft first-hand was an incredible experience I’ll never forget. 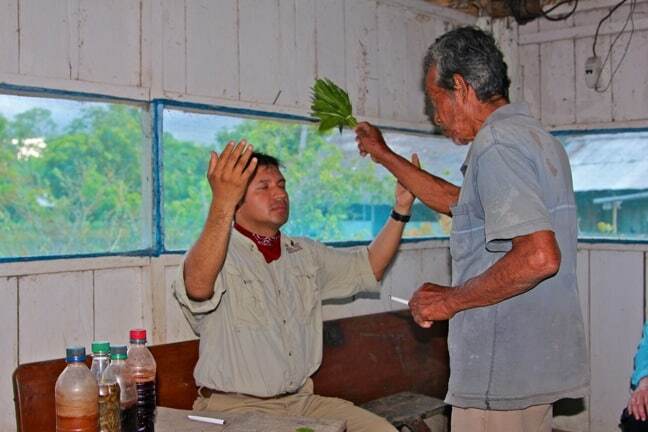 Through Johnny (pictured here receiving the shaman’s blessing), we learned about the oral tradition of the shaman, which has been passed down from generation to generation for hundreds, perhaps thousands of years. Unfortunately the tradition is in danger of dying out, as Don Juan explained that he has had trouble finding students willing to undergo the strict regimen required to study shamanic methods. 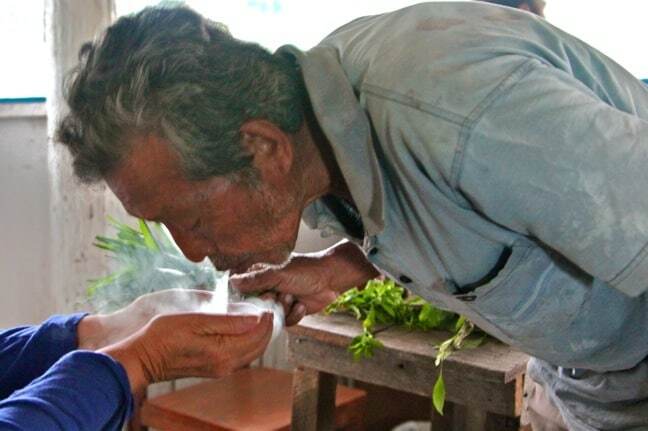 Every plant in the forest serves a purpose, many of which have been co-opted to Western pharmaceutical companies for familiar drugs, and most Ribereños will go to a shaman for healing first before seeking help from traditional Western medicine.